Escape from the ordinary with this Lykos teak roll up string mat. It will bring the feel of a tranquil spa right into your home. Made of responsibly harvested solid teak wood (tectona grandis), it is naturally resistant to mold and mildew. This high quality teak mat by Bare Decor will last you a long time saving you money and the environment. This Lykos roll-up teak floor mat is made of premium solid teak wood and comes in an oiled finish. Perfect for any space outside your sauna, pool, spa, shower, bathroom, deck, boat or RV and will keep your feet warm while providing a clean slip resistant surface. It easily rolls up for quick storage and transportation. Dimensions: 24″W x 24″L x 0.75″H. 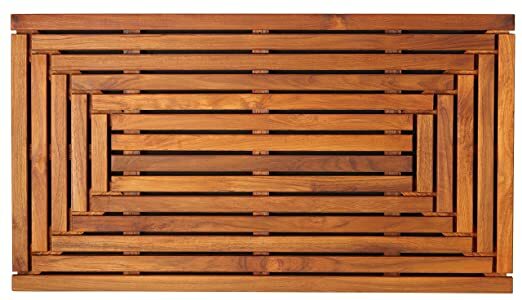 Escape from the ordinary with this X-large Erika teak corner shower mat. It will bring the feel of a tranquil spa right into your home. Made of responsibly harvested solid teak wood (tectona grandis), it is naturally resistant to mold and mildew. This mat is made of premium solid teak wood and comes in an oiled finish. Perfect for a corner space outside your sauna, pool, spa, shower, bathroom, deck, boat or RV and will keep your feet warm while providing a clean slip resistant surface. Measures 30″ x 30″ with one softly rounded corner. The slats are 1.25″ wide and it is 1.5″ off the floor. Inspired by the timeless shape of the hourglass which might have been invented before the 8th century in Europe, this table is perfect for anyone striving for pure, organic decor. The top has been sanded to ensure a flat surface to place your items. The beautiful combination of the polished light teak wood with the raw black accents is an exceptionally unusual feature to any indoor or outdoor space. 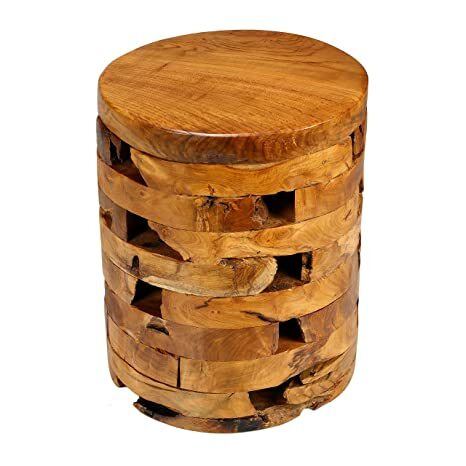 It acts perfectly as a small table, a plant stand, or a stool. Keep in mind that trees are different in shape and grain. So the trunks all have their own unique look. This table is hand made and inherently has many imperfections such as different color wood grain and natural holes. No two are the same and will vary from the picture and dimensions. 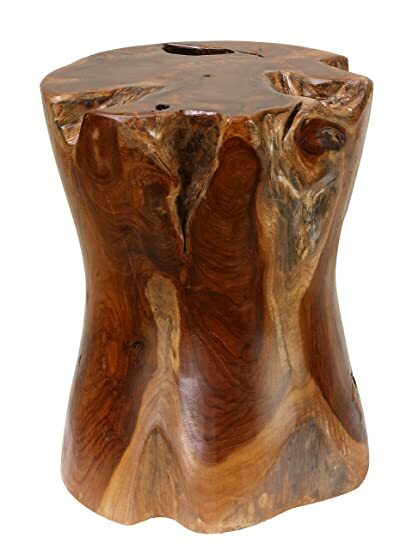 This tree stump’s functional capabilities are endless and it is just waiting for your creative touch! Unleash your inner decorator with this multifunctional piece! Approximate Dimensions: 14″ in Diameter by 19″ high and weight is about 37lbs. 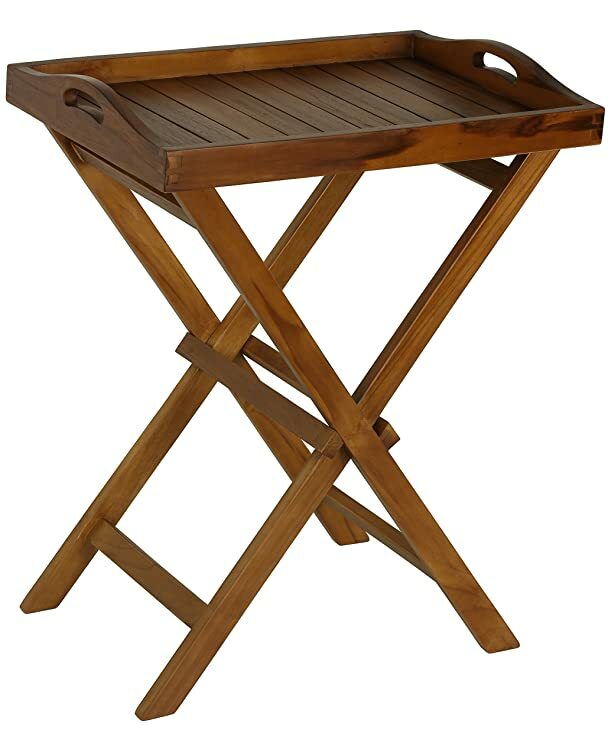 Take the comforts of your home outside with this tray top table. 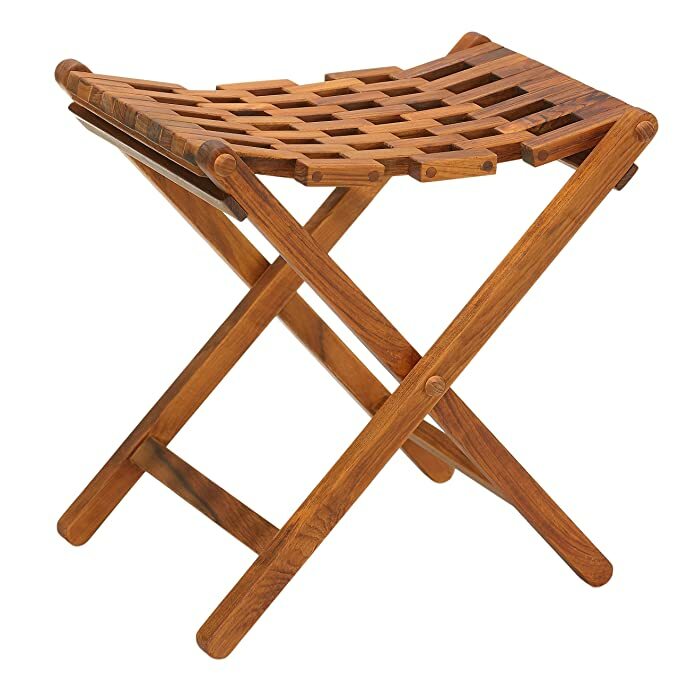 Made of responsibly harvested solid teak wood (tectona grandis), it is naturally resistant to mold and mildew and is outdoors friendly. 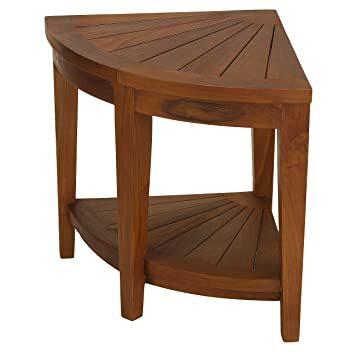 Can be perfectly used as a side table and with its removable tray top easily transforms to a serving table. The wooden surface is nice and even and the handle are large enough for easy serving. Best part is it is fully assembled, just unfold and put the tray on top of the stand. Overall Dimensions: 23.5″W x 15.75″D x 29.75″H weight with stand is 10lbs Tray: 23.5×15.75 and is only 5lbs. The footprint is only 13″ by 20″. 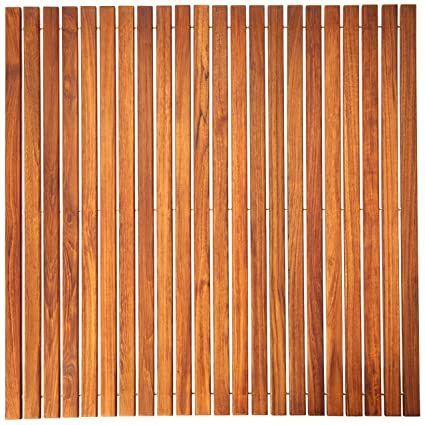 BARE-WF2134 Bare Decor Fuji String Spa Shower Mat in Solid Teak Wood Oiled Finish. 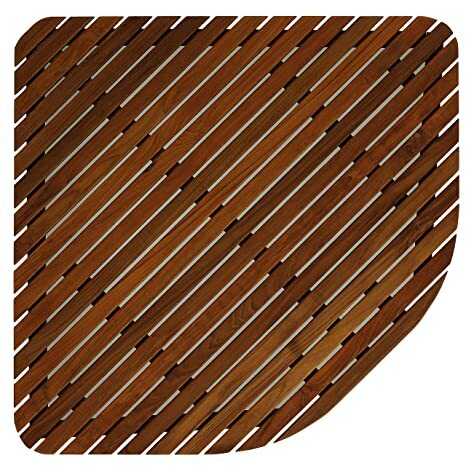 XL Square 30" x 30"
Escape from the ordinary with this borderless Zen teak mat. It will bring the feel of a tranquil spa right into your home. Made of responsibly harvested solid teak wood (tectona grandis), it is naturally resistant to mold and mildew. This teak mat by Bare Decor will last you a long time saving you money and the environment. This Zen teak floor mat is made of premium solid teak wood and comes in an oiled finish. Perfect for any space outside your sauna, pool, spa, shower, bathroom, deck, boat or RV and will keep your feet warm while providing a clean slip resistant surface. Dimensions: 31.5″W x 19.5″L x 1.5″H. 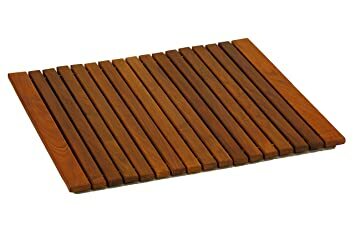 Escape from the ordinary with this Dania teak corner mat. It will bring the feel of a tranquil spa right into your home. Made of responsibly harvested solid teak wood (tectona grandis), it is naturally resistant to mold and mildew. This teak mat by Bare Decor will last you a long time saving you money and the environment. 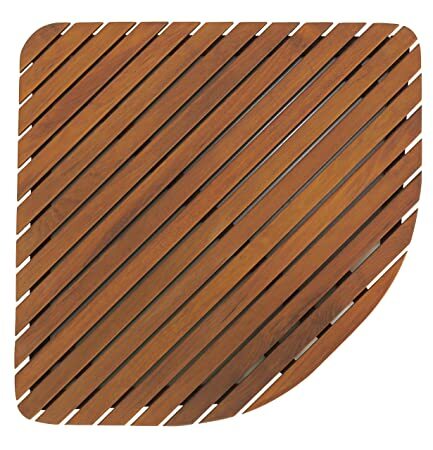 This Dania corner teak floor mat is made of premium solid teak wood and comes in an oiled finish. Perfect for a corner space outside your sauna, pool, spa, shower, bathroom, deck, boat or RV and will keep your feet warm while providing a clean slip resistant surface. Measures 24″ x 24″ with one softly rounded corner. The slats are 1.25″ wide and it is 1.75″ off the floor. BARE-WF2999 Bare Decor Giza Shower, Spa, Door Mat in Solid Teak Wood and Oiled Finish 35.5" x 19.75"
Inspired by the prehistoric Stonehenge monument in Wiltshire, England, this unique table can serve as a coffee table, side table, plant stand, or bed side table. The carefully layered design will add an interesting focal point to your space. The natural reclaimed wood provides a rustic appeal while maintaining clean modern lines that will complement any decor. Please keep in mind, this table is hand made of natural product which has many imperfections such as different color wood grain and random spaces. Everything in nature is one of a kind and so as this piece and each piece will have it’s own unique character that will last you for generations. Dimensions: 14″W x 14″L x 18″H.